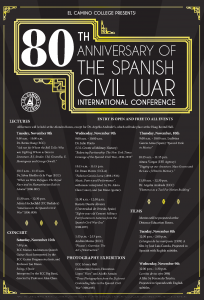 The Foreign Language Department’s Spanish program at El Camino Community College (Torrance, California) is commemorating the 80th anniversary of the Spanish Civil War with a series of activities and lectures from November 8 to 12. The five-day program includes talks on mass graves, pictorial art, military fortifications, news coverage in the US of the conflict, humanitarian aid, exile, music, and dance, as well as a photography exhibit featuring the work of three photographers who covered the war from both Republican- and Nationalist-controlled territory. 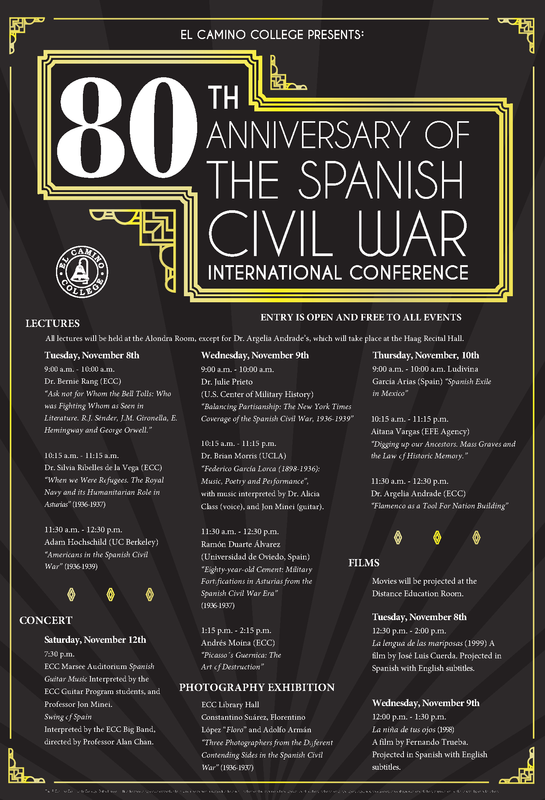 On November 8 at 11:30am, best-selling author Adam Hochschild will give a talk about Americans in the Spanish Civil War. The program will close with a concert. The entire program–available online here–is free and open to the public. Click here for a detailed program in pdf.